With the weather changing and fashion styles changing with it, how do you decide what to wear with this confusing weather? Just this week, Michiganders experienced snow, rain, wind and sunshine. When the weather changes, so does a person’s style. Students on Michigan State’s campus gave tips on what to keep in your closet during these confusing weather times. MSU communication graduate Maya Askew defines herself as fashionable. She enjoys shopping for seasons and looks forward to coming out of coats and switching into jackets. In between seasons, with rain and sun shine, Askew’s favorite tip is to always wear an outfit that can be worn in different but fashionable styles. “I always wear a jacket that’s chic but has a hood. Jeans with rips to keep it cute and you can never go wrong with a T-shirt,” said Askew. With the weather being so “bi-polar,” it’s hard to know what to wear or put up for next season. Lansing Community College business student Chris Dabney finds it hard to decide what to wear during times like this. According to Vogue, the color trends for Spring 2018 are lavender, purple, rose, sky blue, light green and yellow. 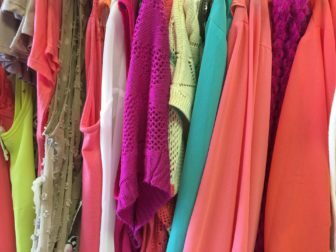 Pastel colors keep fashion light and eye-catching. Colors complemented by patterns and florals are also a trend for the spring. With weather being so unpredictable these days, keeping an umbrella and jacket in the trunk is the smart route. MSU communications senior Saniesha King has been awaiting spring since last fall. Spring cleaning for her starts in February, but King knows what to put away and what to keep out. “Michigan weather is always tricky to me, so you have to stay prepared,” said King. In the midst of April showers bringing May flowers, the weather on campus has left some students in shorts, while others are still zipping up coats. “I take brighter colors, jackets and crops out, but I also keep a rain coat, sweater and boots in arms reach until the weather is in the clear,” said King. The students agreed that there are no real rules during this time of season. “Dress for the weather while staying in style, that’s all,” said Askew. Ciara Page (Ciara Lauren) is an inspiring TV host and personality, from Detroit, Michigan. Ciara has a passion for entertainment news and television. She has interned for HOMTV, wrote for the Social Bee Blog and volunteered at Impact Radio Station. Ciara is currently interning for Lansing City Pulse, involved in school organizations and would currently describe herself as "evolving". Every semester, student loans and tuition bills add up, and students seek help with the cost for school. Part-time jobs and work study can help with a few necessities and maybe even bills outside of school, but how do students manage to afford pricey name brand and designer items while on a college budget? Make-up, skin care and favored couture are evolving every day in the millennial era. The Spartan Newsroom explores different fashion, beauty and health trends in popular culture.